Line, space, and color are crucial to understanding her practice. 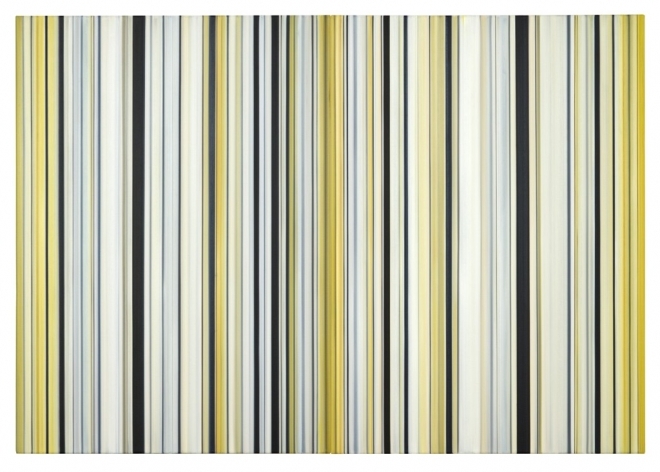 The densely packed lines are straight and vertical, imposingly so in the handful of 7-foot-tall canvases. Some lines are thick; others, thin. Some have sharply defined edges, while others are blurry. There’s space between them, often at irregular intervals. And the color, particularly in her recent works, is subdued, with a keen focus on the contrast between dark and light. Perhaps, then, the titular strokes aren’t just from a brush. Perhaps they’re strokes of a key like those a musician would play in a shimmering melody.